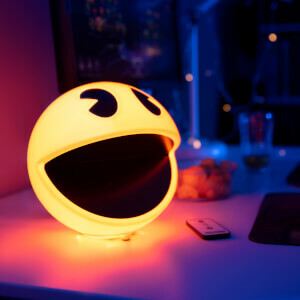 Taking its inspiration from one of the most iconic gaming figures ever created, the Pac-Man Ghost Light is a colour changing mood light with 16 phasing colours that provide retro style to any home. Standing at 20cm tall, the lamp also features a sound-to-light party mode and is easily powered via any USB port. – L.R. Amazing light, easy to use and is very effective, recommend to any gamer or just anyone in general. A good product for a good price. The usb wire that connects the light to the pc is a little short but the light itself was good. My youngest son is packman mad so couldn't resist this when we saw it! Looks great, colour change is really good and will look fab in his bedroom. I bought this as a birthday present for my brothers 20th birthday. It looks really cool lit up, very effective and bright, easy to set up, etc! looks cool on the desktop, bigger than I expected. colors are pretty and the light isn't too strong. the only bad thing about it is that you cannot stop it on one lightning color.